(Bloomberg Opinion) -- Since becoming CEO of Best Buy Co. in 2012, Hubert Joly has essentially run a clinic on how to transform a troubled brick-and-mortar retailer for the digital era. With price matching, cost cutting, and investments in customer service, he Amazon-proofed a once-flailing company. Now, Joly is passing the baton to one of his key deputies. The company announced Monday that Corie Barry, currently Best Buy’s CFO and chief strategic transformation officer, has been selected as the company’s next CEO, a job she is expected to assume on June 11. Joly is set to become executive chairman at that time, continuing to advise Barry on strategy and other matters. 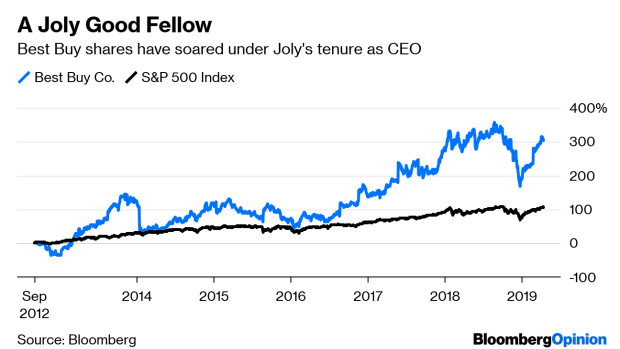 I understand if investors are a little uneasy about the departure, given what a strong steward Joly has been of Best Buy. Comparable sales growth has become routine and profitability has improved. The price of shares has jumped more than 300 percent since his arrival, and total shareholder returns have leaped more than 400 percent. But signs point to this being a healthy transition of power to a leader who has played a major role in Best Buy’s recent hot streak. Investors ought to give Barry the benefit of the doubt that she can keep Best Buy on the right path. Barry has been involved with everything from Best Buy’s finances to its digital efforts to its new division focused on technology for the aging population. She played a key role in the development of Best Buy’s in-home advisors program, which sends experts to shopper’s doorsteps to provide tech consultations and has been a cornerstone of its commitment to customer service. And, unlike the succession messes we’ve seen at other retailers of late – including J. Crew Group, which just replaced its temporary “office of the CEO” with an “interim CEO” – the Best Buy transition seems extremely choreographed. That’s a sign it is a product of careful, un-hasty consideration. Barry will face challenges in her new role. Best Buy is marching into new territory with its ambitions for technology to assist the aging population. And the replacement cycle for smartphones is slowing down, making this crucial business segment more difficult. She’ll also have to contend with Best Buy investors, who have shown themselves to be a jumpy bunch. Remember in August 2017 when Best Buy reported booming quarterly comparable sales growth and raised its annual guidance, but shares tanked that day because Joly stated the revenue figure wasn’t “a new normal” that would continue indefinitely? It was a remark that, to my mind, was just stating the obvious for a company that is healthy and moving past turnaround mode. But it illustrates how investors always seem to be looking extra hard for signs that this company is losing steam. Barry will have to learn how to assuage their worries – or shrug them off. But, overall, this looks set to be a smooth transition that should serve Barry and Best Buy investors well.